Fire in the Blood is an astounding documentary charting the reality behind the control of pharmaceutical drugs and how this impacts the people living with HIV in South Africa. Part of the official Sundance Film Festival Selection in 2013 it’s easy to see why. While the subject matter of this documentary is naturally engaging the presentation of the horrific abuse of power at the cost of human life is truly brilliant. 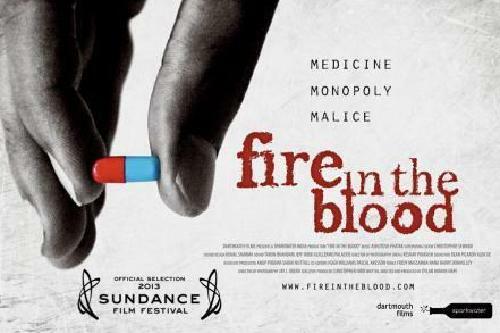 Fire in the Blood tells the harrowing tale of pharmaceutical companies making access to life saving drugs, unreachable and unaffordable for people in the countries worse affected. Through real life accounts from those living with the disease, those fighting to change the laws, and those taking drastic action, sometimes risking their own lives and braking the law to change the system we are told a story so astounding it’s hard to believe this is allowed to happen in the modern world. Through a series of interviews, investigative journalism, real life accounts and expert opinions this film quickly and concisely tackles the issue at hand. Well presented, paced and pieced together in style that makes a totally new subject accessible to every viewer, this film deserves to be seen. Not only is it educational it is at times heartbreaking and often inspiring. Moving and unrelenting Fire in the Blood offers an engaging and inspiring tale that will shock, stun and at times warm your heart. Fire in the Blood is released today. This entry was posted by Vicky Hinault on February 22, 2013 at 11:30 am, and is filed under Reviews. Follow any responses to this post through RSS 2.0.You can leave a response or trackback from your own site.